Join EYMM and 24 fellow bloggers as we celebrate the first 24 months of our pattern shop with a huge sale and giveaway! We will be featuring 8 different patterns for women and girls, as well as having a Manic Monday sale and a huge site-wide sale. There is also a great giveaway at the bottom of this post. Don’t wait because you don’t see sales like this often from EYMM and it will be over before you know it! Not only is there an AMAZING blog tour going on but 1 lucky winner that leaves a comment below between now and 8/3/15 will win a FREE EYMM pattern of their choice!!!! Which one would you pick? I haven’t been sewing for myself very long, and when I do, I find myself going back to only a couple designers. Mostly because I like the fit and know what size to sew, so I don’t have to take the time to measure myself and all that. Kymy from Everything Your Mama Made (EYMM) is one of those designers. I have been following almost from the beginning and even got to meet her (and her awesome kids!) last summer! Both my daughter and I love her patterns! For this tour, I decided to sew up the new Women’s Capsule Skirt and the Kymy’s Dolman Top. Both of these were new to me patterns and I am in love with the results! I love that I can put EYMM patterns together with no trimming! As a busy mom, stuff gets pushed to the back of the sewing queue if it can’t be put together during an episode of Baby Signing time or Curious George! This little guy loves to “help” put patterns together, which usually means more work for me! I recently met up with a sewing friend and we swapped fabric, and I found this navy and cream print to be perfect for the Capsule Skirt! For the top, I had this wonderful red fabric from Joann’s. I love the drape of it! Both fabrics are prefect for these patterns! I hope I have inspired you to check out EYMM patterns! Be sure to check out the other posts along the tour! Then hop on over to EYMM to check out the awesome <a href=”http://www.eymm.com/2015/07/26/2nd-anniversary/”>SALE</a&gt;, and an even bigger <a href=”http://www.eymm.com/2015/07/26/2nd-anniversary/&#8221; target=”_blank”>celebration giveaway</a> with over $1000 in prizes. There will be 40 winners in all. Also as a reminder, confirmation emails and password reset emails will start going out again tomorrow after 9am PST. You can still order now and log into your account to view your order and download your files. I think I would get either Riley’s Nightgown or Carlie’s Dolman top. Hi Tami! Yes, we are big fans of the nightgown as well! I would probably pick the dolman top. Love your outfit! Thank you! I wore it out for Date night last night and got quite a few compliments! Love EYMM! I have the Dolman top, Cala skirt, and Capsule skirt. I love all three. I’d love to sew up one of these Capsule skirts for myself too! 🙂 Love your version! Thanks! 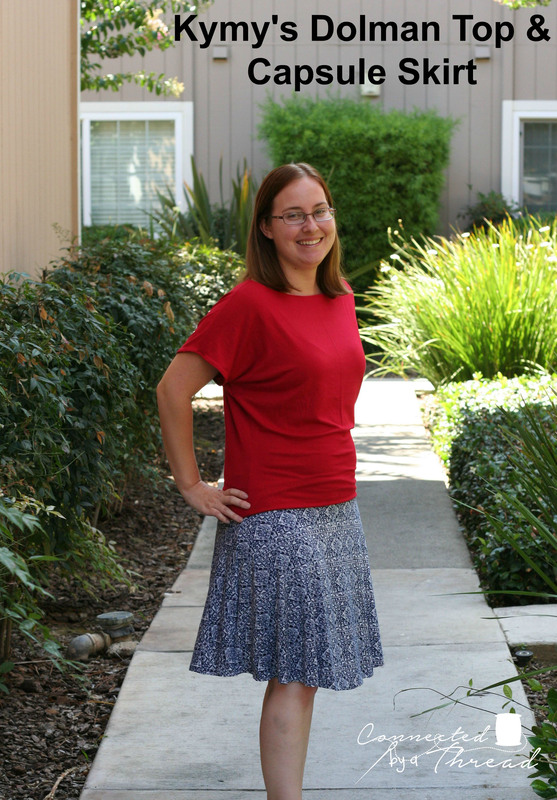 It is a lovely skirt and quick to sew! I love the look of the Capsule Skirt. You’re right, it does look fabulous with the dolman top. I just bought the top yesterday and haven’t had a chance to make it yet but I can’t wait. The Calla Lily skirt is on my wish list. I might have to see how it would work with the top. The Calla Lily would look great with the Dolman top! I love your outfit! I would love to get the Capsule Skirt! Thanks! It really is a great skirt! Just made the Capsule skirt. Love! Maybe I would get the nightgown. Super classy combo you have. You look great! I have almost all of them, so I would pick Kenzie’s party dress. Nice patterns and very flattering style. I love the off the shoulder top and tunic! I’d like to try the Harem pants. The capsule skirt looks cute the way it drapes in the first picture. I like the hoody pattern but seeing the capsule skirt sewn up, I might get that one..
Love your skirt! I can’t wait to try this pattern too. I love how these look on you, I need to sew up some Dolman tops I think. I would pick the Dolman Top. Thinking about fall and looking to the cardigan pattern!! I would choose Kymy’s Dolman top too! It looks super cute on you, so maybe it would on me too!